I do like a classic detective novel from the British Golden Age. The reigning queens of the genre – Dorothy L Sayers, Ngaio Marsh, Agatha Christie, Margery Allingham, and Josephine Tey – are superb novelists, and highly influential stylists. It would be a fine thing to discover forgotten writers who are as good as they are, but the chances are slight. Quality will out itself, since any novelist who sold well and looks likely to have a continuing or revivified market will find a reprinting publisher. Dean Street Press, a reprint publisher devoted to cricketing works and forgotten novelists, has republished Ianthe Jerrold’s first two novels, in beautiful retro covers with a eulogistic fanfare of how The Studio Crime (1929) is a ‘classic whodunit’, and Dead Man’s Quarry (1930) is ‘classic’ and ‘influential’. Jerrold was a member of the Detection Club, so her peers clearly saw her quality, and these novels are both properly crafted works of detection with all GA boxes ticked: the upper-class amateur detective, the witty banter, the stodgy policeman, due attention paid to police procedures, the obvious red herrings, the subtly hidden clues, and the suggestion of romantic flutterings between the hero and the girl of the moment. And yet, and yet: these are not great novels. They are certainly good novels: Jerrold was a workmanlike writer, an efficient and deft constructor of plots, and had an ear for strong dialogue, and a sensible approach to the depth of background detail required to keep the plot zipping along. The novels haven’t dated because she kept the dialogue free of slang, and her characters’s concerns are timeless, solid and believable. Yet there is also a lack of detail that ought to be there: one character mentions Coué, but nobody mentions the War. These are not novels I can get wildly enthusiastic about. The format I read them in is partly to blame, so, ebook lovers, skip to the next paragraph. Dean Street sent me the epub versions, since they, quite reasonably, only have so many paperback copies for reviewers. I bloody loathe reading ebooks, because I spend my days working on screen, and have no desire to keep staring at glowing pixels for relaxation. Ebooks are disruptive, forcing technology’s limitations between me and the words with miserable results. No device, no software, no whizzy app, will be as good as the perfect technology of a book made of paper pages that allow you to read the story in the order you want to, to see its maps at the front, glossary at the back, and the cover, at the same time. To have to rely on battery power to read enrages me. To have to perfect the right kind of finger-swooshing swipe to get to the next page aggravates me when I can’t ‘turn’ over one page without zooming past thirty. The ebook’s print size may be infinitely enlargeable, but that’s the only advantage I can see in these essentially utilitarian devices. Rant over. These novels are both available as paperbacks, so no-one need go through what I did. The other reason for my limp enthusiasm for these Jerrold novels is that they are not great premier league novels, but rather average novels from much lower down the tables. Dead Man’s Quarry is the better of the two. Its emotional tension and plot about the unwelcome heir reminded me of Josephine Tey’s Brat Farrar. The splendid country setting recalls Malcolm Saville’s Welsh border cycling adventures. It has solid good writing and very successful plot twists. The Studio Crime, which from its plot about artists and London café society ought to be in the league of Ngaio Marsh’s Artists in Crime, is not as good as that (but it was Jerrold’s first novel, to be fair). The best I can say of The Studio Crime is that it’s as good as a so-so Agatha Christie: efficient, following the rules, but without passion or depth. 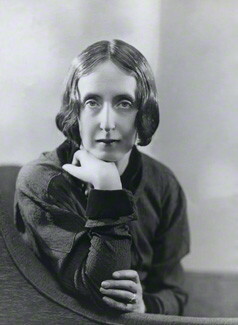 At this stage in her career (she wrote romances and other works later in her life) Jerrold was not a novelist, but a teller of detective stories. Her plots are ingenious, but my word, The Studio Crime has so much ingeniosity that the story is swamped. We get sidetracked by the attempt to identity the man in the fez with a squint and gold tooth, and hear almost nothing about the more important women medical students from the 1920s. The detective, John Christmas, is blander than Allingham’s Albert Campion on his first appearance and has the same astonishing access to public and private records which feels implausible because he isn’t also given Campion’s indefinable assurance. The red herrings in this novel don’t smell bad, they just sit there looking at you. Dead Man’s Quarry has much more interesting set-piece confrontations, and characters with more bite and zing. Start with Dead Man’s Quarry, and, if hooked, go on to enjoy The Studio Crime as well. 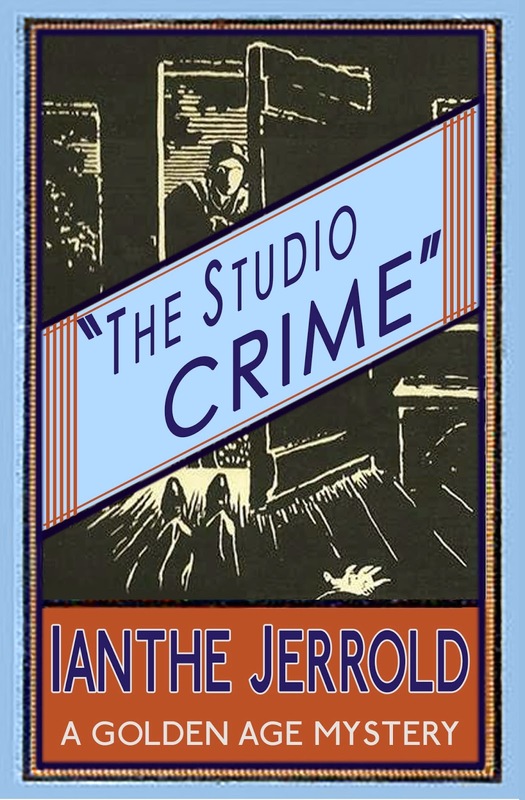 The Studio Crime (1929), (Dean Street Press, May 2015), ISBN 978 1 910570 29 6 (ebook)/978 1 910570 44 9 (paperback). 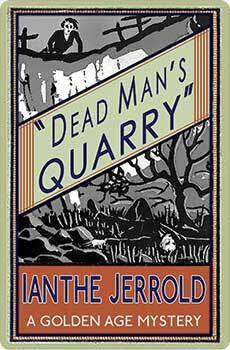 Dead Man’s Quarry (1930), (Dean Street Press May 2015), ISBN 978 1 910570 30 2 (ebook)/978 1 910570 45 6 (paperback). Prices vary depending on the format and the country you buy it in. I agree with you absolutely re ebooks – I also have e versions of these which I haven’t got round to yet but I like the workaday description you give them. Sometimes that’s exactly what I want. Well, honesty, and clarity, is usually the best way to do these things. My review copies of the Jerrold books took two months to arrive (from Canada, bizarrely) so have only just got round to The Studio Crime and find myself in almost total agreement with you. I too noticed that nobody mentioned the war – nor the London Underground or the fact that there were telephones (well not until page 220) – and were there still “Crossing Sweepers” in 1929? Having read it, I immediately re-read Allingham’s “Crime At Black Dudley” from the same year and John Christmas comes out as positively vanilla compared to Campion even then (though I probably would say that!). “Studio Crime” wasn’t bad – goodness knows I’ve read worse – but hardly a ‘classic’. At times it was positively Victorian as opposed to Roaring Twenties and I lost count of the mentions of handkerchiefs: grimy ones, blood-stained ones and one (miraculously) still damp “with tears” a day after being discarded. Some of the minor characters did shine though, especially the ‘eupeptic’ Serafine Wimpole who was probably not ‘Coue’ at all. Hah! I’m reading Allingham’s Mystery Mile right now, and Campion is already mutating from the eccentric young knowitall about town into a proper detective. i rather like him in this transitional state when Margery A was beginning to find out new and more interesting things to do with him. Flowers for the Judge is the novel the displays the new serious, truly believable Campion. And you’re right, John Christmas is just nothing compared to Campion even at his most irritating. It seems to me that you are unaware of the history of the genre about which you are writing. At the time these books were published there was simply no such thing as a mystery novel. Mysteries of that era were simply entertainment, along the lines of a crossword puzzle. A game played between author and reader. Can the reader interpret the clues and solve the puzzle before the detective reveals the solution. Detectives were not supposed to have a life of their own. They existed only as a conduit for getting the clues to the reader, unlike the modern detective whose family, personal problems and interests such as taste in music make up at least half of a modern mystery novel. Note that the Detection Club itself did not even exist when these were written. It was only after that, largely as the result of efforts by Dorothy L Sayers, notably in her book Gaudy Night, that mysteries began to be crime novels. These books by Jerrold are excellent examples of what a mystery story was before it became something quite different, something more than a puzzle, but to expect them to be novels in the way that we expect of a modern mystery makes no more sense than to expect a painting by Gainsborough to be like a painting by Picasso. Both can be great, but they are not expected to be great in the same way. I disagree. E C Bentley, Agatha Christie and Dorothy L Sayers were all establishing the detective as a personality in this genre long before Jerrold was writing. The existence of the Detection Club was a formalisation of the genre as a marketing niche, not a guide for how to write the things. You seem to be making my case as to your lack of historical knowledge of mysteries. Bentley only wrote two books about his detective, Philip Trent. The first one, Trent’s Last Case (aside from being written prior to what is general considered the Golden Age i.e. between the wars) was in fact a parody of detective fiction in which his detective was completely wrong in his conclusions and swore never to try being a detective again, the second one, Trent’s Own Case was only published in 1936. Agatha Christie’s primary detective character, Hercule Poirot, far from being a personality was never more than an ego and a set of mustaches, about whose life we know virtually nothing; and Sayers is exactly the writer I cited as trying, sucessfully, to make the mystery into more than a mere puzzle and although Wimsey was created prior to Jerrold’s books, Gaudy Night and her other books featuring Harriet Vane are generally considered to be when she actually first achieved this. Strong Poison was the first book in which Harriet appears. It was published in 1930. Also, where did you get the idea that anyone claimed the Detection Club was some sort of guide for how to write anything? Have you even read Martin Edwards recent history of that institution, The Golden Age of Murder? No, I still disagree with you. And I hope to be receiving Martin’s book for Christmas. I enjoyed both of the John Christmas books, particularly Dead Man’s Quarry which was ingenious and nicely written. As is often the case, the main plot premise doesn’t stand up to close inspection (I think you’d struggle to convince an audience if you made a TV version of this. Won’t say more for fear of giving the murderer away), but that’s not really the point. It works within the reality of the whodunnit. Dead Man’s Quarry was interesting to me in another way too. I haven’t read many books before that describe the Welsh Borders region (where i happened to be staying when i read the book) between the Wars. Ianthe Jerrold did a good job of conveying the atmosphere of that place and time. For example, she captured the feeling of distance from towns and the way something like modernity was beginning to penetrate a rural, traditional world. She didn’t labour the point, but it was there. Not sure why you think it’s such an oversight that Jerrold failed to mention WW1 when writing a book ten or eleven years later, especially given the fact that it doesn’t have anything to do with the plot. Would a book written in the mid to late 50s have to mention WW2? Interesting about the Welsh settings being unusual. I mentioned the missing WW1 references because it was simply a standard feature of all popular (and much ‘literary’) fiction published between the wars to mention the war. Either as a marker of time, or as a character description, or a moral judgement (having fought, or not, in the war). it was inescapable, so for Jerrold to avoid that was unusual. The lack of other small things signals an insufficient grip on the details of her characters’ lives, that makes the difference between a great novelist and a good or workmanlike one.